Availability: This product is discontinued and no longer available for purchase. For alternatives browse our Running Watches department. The Timex T5K689 men’s Ironman Traditional 50-lap watch has a stylish, sporty design and offers a digital display with large numerals and date function. If features a 100-hour chronograph with lap or split, a 50-lap memory recall, a 99-lap counter and three separate alarms. This full size watch has a durable resin strap and allows you to customize the features. It is water resistant up to 100m, comes with the INDIGLO® night light and offers one-touch NIGHT-MODE® to keep you safe and ensure great vision in the dark. Additionally, it has 3 time zone settings for added comfort while travelling and comes with a 1 year warranty. 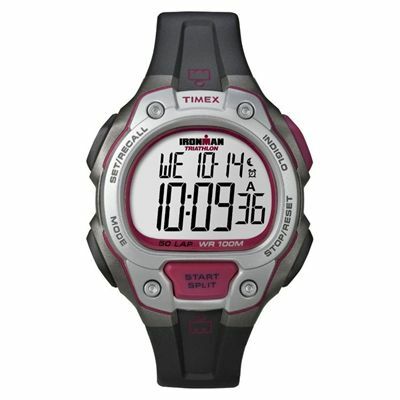 for submitting product review about Timex T5K689 Mens Ironman Traditional 50-Lap Watch.